World War I (1914-1919) is arguably the defining event of the 20th century. For those who lived it, it was frightening, chaotic, and bizarre. It was traumatizing and transforming. However, 100 years later World War I is often lost in the collective consciousness. Edmund W. Greacen (1876 – 1949) does not blind us with graphic illustrations of violent action. Instead, he uses faceless depictions and soft, muted tones to make us aware of the devastation of the Great War. Edmund Greacen was raised in the heart of New York City, and received a degree from New York University. With the outbreak of the Spanish-American War, Greacen was eager to serve his country in the military. His father, hoping to curb his eagerness for soldiering, sent Greacen on a post-graduation tour of Europe where his interest in art blossomed. Upon his return, Greacen enrolled in an art school run by William Merritt Chase, and later traveled with Chase to Europe on one of his art study tours. Greacen and his wife Ethol remained in France until 1909 becoming an integral part of the American Impressionist colony in Giverny. 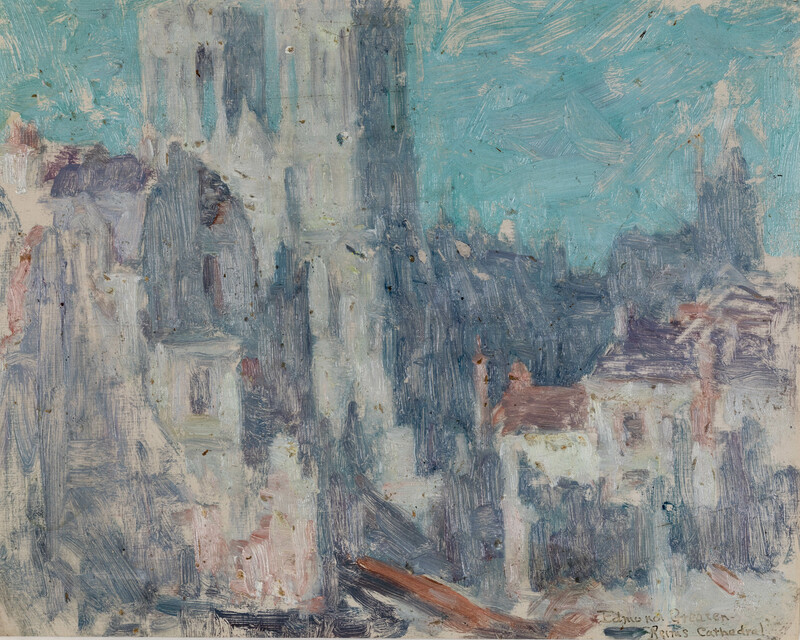 Greatly influenced by this experience, in 1909, Greacen helped establish an “American Giverny” in Old Lyme, Connecticut, where he and other American Impressionists continued to paint while exhibiting their works in New York and across the Northeast. 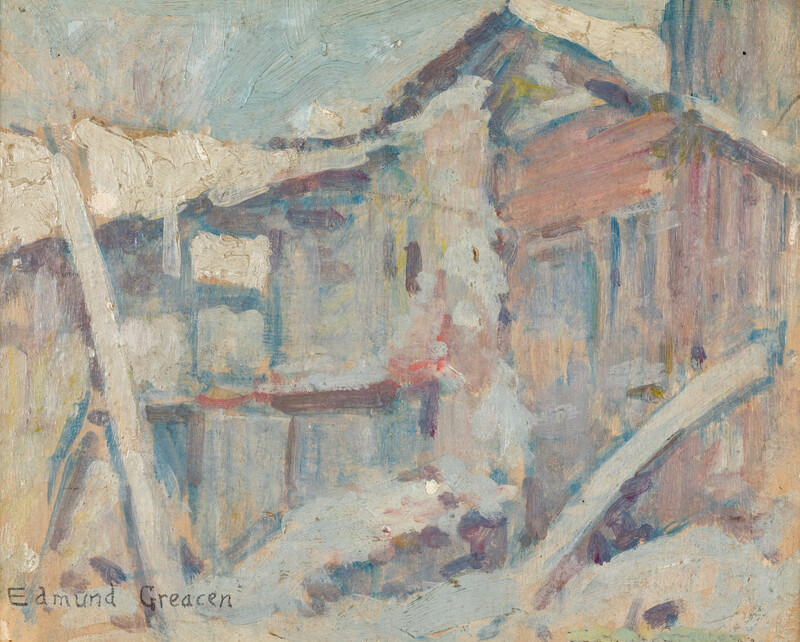 After the War, Greacen continued to paint at Old Lyme and became a pioneer in the artistic community. He was elected as a member of the National Academy of Design in 1920. In 1922, Greacen founded an artists’ cooperative in New York City known as the Grand Central Art Galleries, a non-profit gallery where artists could keep their work on continuous exhibit. Two years later, Greacen attached a related art school, the largest in New York City, that would last for 20 years until Greacen’s health began to decline. A few years before his death, the Greacens moved to Florida’s Gulf Coast but ultimately returned to New York where Greacen died in 1949. World War I broke out in Europe in 1914. However it did not gain America’s attention until the sinking of the RMS Lusitania in 1915. Greacen became eager to see the U.S. enter the War. The married father, 41 years of age, registered as a Private in Co. B of the New York Guard’s 7th Infantry. Because of his age and family status, Greacen did not assume active duty. Instead, he found employment as Overseas Secretary for the YMCA’s War Work Council, and he departed for France in October 1918. As Overseas Secretary for the YMCA’s War Work Council, Greacen landed in France with the task of overseeing Foyers du Soldat, respite stations for troops returning from the front lines. Greacen’s ability to speak French allowed him to communicate well with French soldiers and teach French to American soldiers. 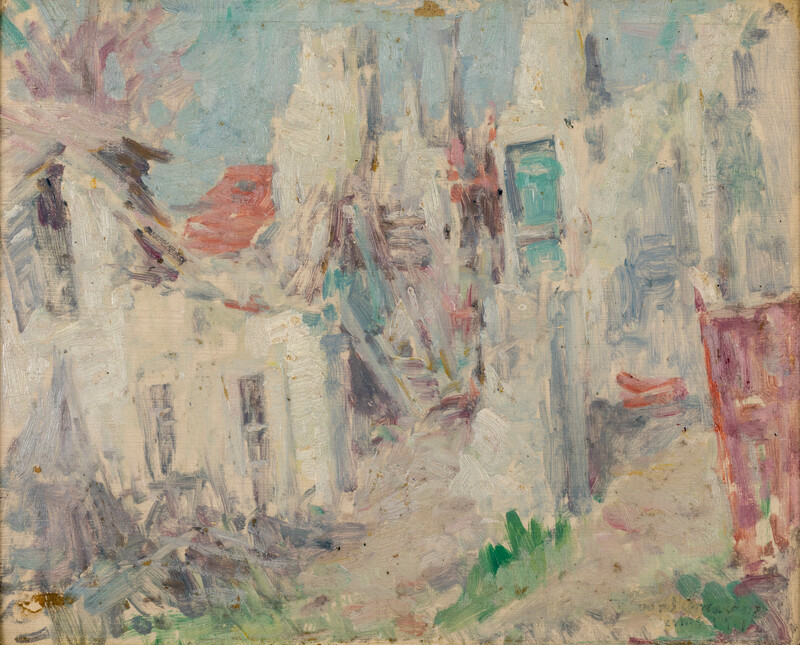 Greacen carried out various other assignments as he traveled throughout the Alsace-Lorraine region of France, an area heavily damaged by the recent violence. Greacen took his sketchbook and paints to record his experiences and capture the monotony of life as a soldier in war, reflected in the almost faceless figures and monochromatic color scheme of his depictions. 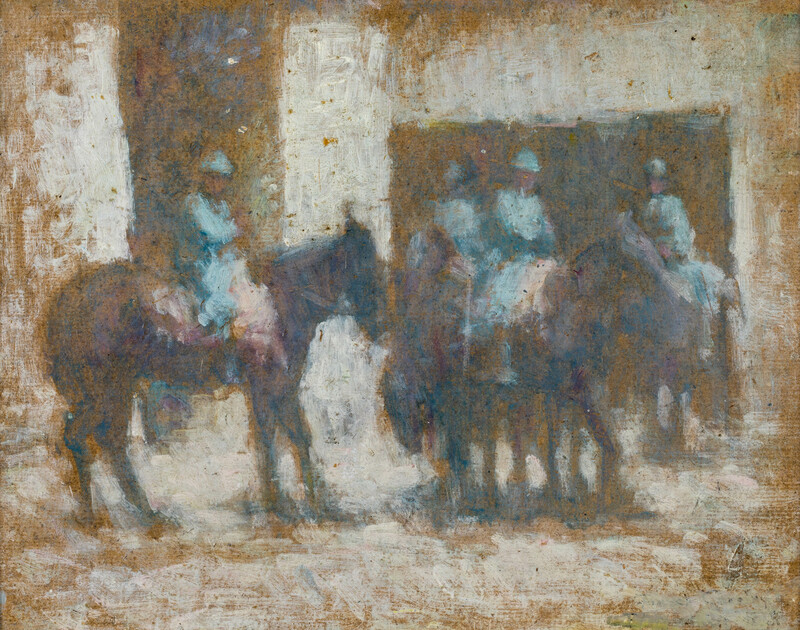 During his service in France, Greacen completed 25 small oil sketches. Because he was consistently on the move, some of his works did not have sufficient time to dry. Some may have even stuck together, evidence of which can still be seen. Greacen travelled extensively throughout Alsace-Lorraine, including the once majestic medieval towns of Reims, Verdun, and the Vosges that were subjected to some of the heaviest fighting of World War I. 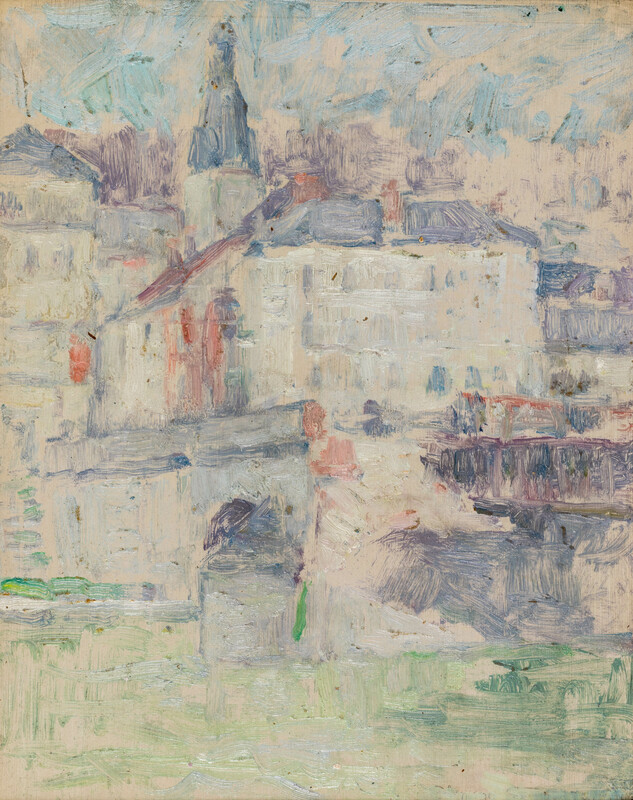 Before the war, Greacen’s Monet-inspired Impressionist style emphasized broad sweeping strokes of soft, dreamy pastel views of beaches, gardens, and women. 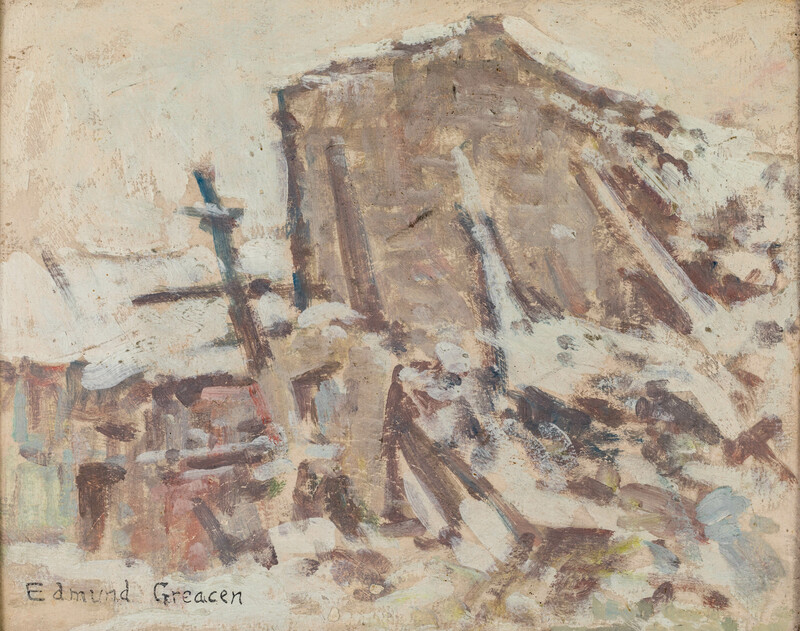 However, during his time in France amongst the devastation of war, Greacen captured the haunting scenes of war-torn France through the use of pale, eerie, wintery tones, emphasizing the grim nature of war. With the German offensive stopped, an armistice was agreed upon on November 11, 1918. Despite the cease-fire, many soldiers on both sides remained in the field behind their pre-war borders until the Treaty of Versailles was signed in the summer of 1919, officially ending the Great War. As American soldiers, including Greacen, began to return home they were met with decorative parades and joyous embraces from those they had left behind two years earlier. But this excitement could not mask the lasting effects the war had on the soldiers, nor the sorrow felt by the families of the roughly 120,000 fallen Americans.